For a moment, Zimbabwe’s July 30, 2018, elections seemed to promise relief from a traumatic political past. An aging autocrat had been deposed and his successor intoned pledges of “a new dispensation.” A dormant opposition movement began to reawaken to opportunities for open political campaigning. At home and abroad, Zimbabwe’s well-wishers allowed themselves a cautious hope that change was finally afoot. But change was not to be. Instead, the 2018 electoral contest left the nation deeply divided (Reuters, 2018). The run-up to the vote reproduced patterns of unfair campaigning, one-party dominance, and political intimidation inherited from the past. Election observers noted that the voters’ register remained opaque and biased, that the ruling party showered its supporters with public handouts (including food aid), and that soldiers, party militants, and traditional leaders continued to threaten the electorate, especially in rural areas.1 These combined irregularities helped the incumbent Zimbabwe African National Union-Patriotic Front (ZANU-PF) to assemble enough votes for a two-thirds super-majority (180 out of 270 seats) in the lower house of Parliament. The presidential election, however, was a far closer affair. 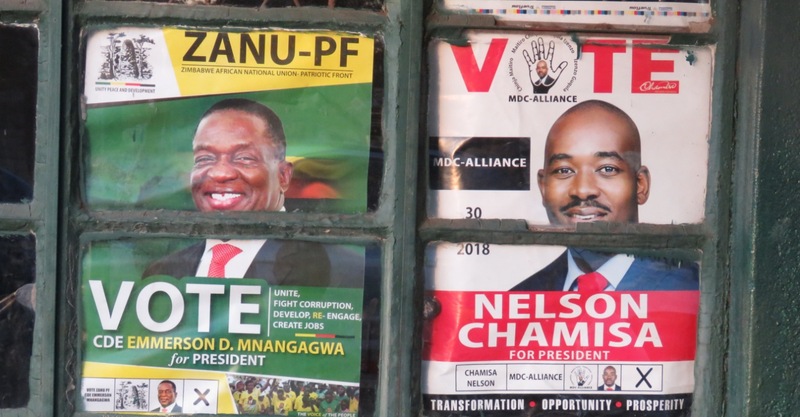 According to official results, President Emmerson Mnangagwa secured 50.7% of the valid votes against 44.3% for the challenger, Nelson Chamisa of the Movement for Democratic Change (MDC) Alliance (Zimbabwe Electoral Commission, 2018). This outcome was broadly consistent with Afrobarometer surveys of voter opinion conducted before the election.2 Yet Chamisa cried foul; he denounced parliamentary results as “rigged,” raised suspicions about delays in tallying the presidential count, and, before an official result was announced, declared that he had won the presidency. If nothing else, the challenger’s refusal to accept the election outcome revealed a yawning chasm between the entrenched positions of the top political contenders. And the close and contested presidential result signaled that Mnangagwa had not succeeded in his bid to use the 2018 elections to legitimize his hold on power.